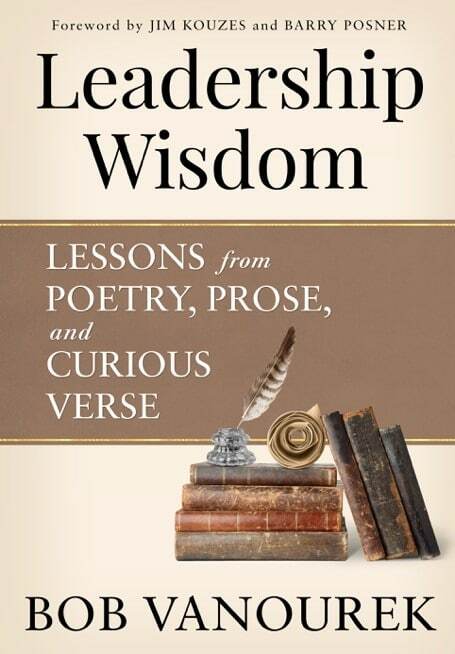 Bob’s newest book, Leadership Wisdom: Lessons from Poetry, Prose, and Curious Verse, will be released by Motivational Press on May 3, 2016. The book is a compendium of timeless, inspiring wisdom on leadership from the sages of literature and outstanding leaders written over the centuries right up to the present day. Bob has selected over 70 poems, prose, or speech passages, each with an insightful leadership message. He combines these pearls with engaging commentary from his own vast leadership experience and closes each entry with practical applications that each reader can use immediately. You will hear from an astonishing array of poets, presidents, activists, soldiers, educators, journalists, CEOs, and even unknown authors. You will be exposed to biblical passages, several faith traditions, and Native American wisdom. This treasure trove will activate your creative right-brain and then challenge your logical left-brain. Many people have said they’ll want to give copies to friends or family they care about. If you order three or more copies, Bob will give you or someone you designate a free leadership coaching session by phone. Preorder here on Amazon if you wish.